SIMFEROPOL, Crimea -- Little has outwardly changed in Crimea one year on from its annexation by Russia, but a harsh crackdown on voices of dissent is underway. Crowds wave the Russian flag and others sport the St George ribbon, a symbol of victory over Nazi Germany that Ukrainian separatists have adopted, at a pro-Putin rally in the Crimean city of Simferopol. The district court in the suburbs of Crimea’s capital, Simferopol, has changed little in appearance since Russia took over the peninsula. It has the same shabby corridors, the same prefabricated wooden furniture and the same prosecutors and judges working in it as it did a year ago. The only noticeable change is the flag flying in its courtrooms. On Thursday, Judge Natalia Urzhumova sentenced three locals to 40 hours of manual labour. Their crime: to have displayed the Ukrainian flag to which, until a year ago, the judge herself had pledged allegiance, and which had been on display in the very courtroom where the trial took place. The trial showed both how much Crimea has changed in the past year, and how in many ways it has stayed the same. As the peninsula prepares to mark the one-year anniversary of Russia’s takeover, seen as an illegal annexation by most of the world but “historical justice” in Moscow, all memory of the region’s Ukrainian past is being erased, and a harsh crackdown on voices of dissent is under way. But at the same time, Russia’s police, judicial and civil servant corpus on the peninsula is almost entirely made up of those who used to serve Ukraine. Leonid Kuzmin, Alexander Kravchenko and Veldar Shukhurdzhiyev were all found guilty of breaking the rules of a gathering to celebrate the anniversary of the birth of the Ukrainian poet Taras Shevchenko. All three men were sentenced to 10 days of manual labour for their actions at the rally organised by Kuzmin, a 24-year-old history teacher. The event was a low-key gathering on Monday, where around 20 people read poetry in a park on the outskirts of Simferopol. During the trial, the Ukrainian flag was described as “extremist”, “provocative” and “forbidden” by police witnesses. In her verdicts, Urzhumova said that, as Ukraine had not existed as a state at the time Shevchenko wrote poetry, the Ukrainian flag could not have any link to him. Monday marks the one-year anniversary since a hastily organised referendum saw Crimeans vote overwhelmingly to join Russia, after the Maidan revolution in Kiev had deposed Ukrainian president Viktor Yanukovych. In trailers for a three-hour documentary about the events in Crimea last year due to be broadcast on Sunday night on Russian state television, President Vladimir Putin subverted his own previous narrative: that the Russian decision to take over the peninsula was purely a response to the overwhelming desire of the local population expressed in the referendum. Instead, he said, after meeting all night with his security chiefs the night after Yanukovych fled Kiev, he took the decision to annex the region. “I said to my colleagues: ‘We must start working on returning Crimea to Russia,’” Putin said. Soon after, Russian army soldiers appeared on the peninsula, wearing unmarked uniforms. At the time, Putin denied their presence, and the soldiers became known as “little green men”. 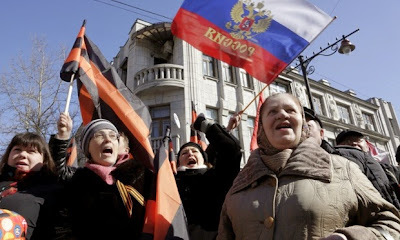 Despite the dubious nature of the referendum and the admission that it was all planned from Moscow, there is no doubt that support for joining Russia remains high among Crimea’s population. One indicator of this is how few people Moscow has needed to import from the mainland to run the region. A year on, the currency in Crimea has changed, the phone numbers have changed, the banks have changed, but most of the people running the region are the same. “Perhaps a few dozen top leaders have come in, but everywhere else, the structures which were Ukrainian before simply became Russian,” said Ilmi Umerov, who was the head of Bakhchisarai region before resigning in September because he did not want to work with the Russian authorities. Umerov said the only new arrival in Bakhchisarai region was an FSB officer from Krasnoyarsk region in Siberia who has taken over the local FSB office. “When he came to introduce himself to me, he told me he’d never been to Crimea before. He didn’t even know the basic geography of the place,” said Umerov. However, he had plenty of help: the entire local SBU office defected to the FSB. The former local head of the SBU is now the deputy. Each region of Crimea was given a “courier region” in Russia, which sent specialists over to train the locals. The Kremlin’s minister for Crimea, Oleg Saveliev, who is on the EU sanctions list, said in an interview in Simferopol on Friday that the programme to retrain local civil servants was continuing, but that there were fewer officials here on a permanent basis. It will likely take many years before the transition is fully complete. When sentencing one of the defendants in the Shevchenko case, Judge Urzhumova initially handed down a punishment of 48 hours of manual labour, even though the law she charged him under specifies a maximum of 40. She frequently had to check various books on Russian law she had in front of her. “Sometimes they ask to adjourn overnight so they can go home and read the laws,” said one Crimean lawyer. The annexation led to the worst crisis between Russia and the west since the cold war, and sanctions introduced by the US and European Union mean Visa and Mastercard do not work in Crimea, leaving a mainly cash-based economy, while major Russian banks and chains have not entered the peninsula, fearing that to do so will lead to western sanctions. Salaries and pensions have gone up, but inflation has also skyrocketed. Saveliev says the authorities are monitoring public opinion and claims there is still 95% support for the Russian takeover. The level of support is undoubtedly high, but may not be quite so overwhelming. People are very wary of speaking out, and most asked for their names not to be used even when expressing neutral opinions. Very few journalists working for publications not loyal to the new Crimean authorities remain. On Friday morning, FSB agents searched the family apartments of two journalists who work for a pro-Ukrainian agency. A number of prominent Crimean Tatar leaders, who have advocated a policy of boycotting the new Russian authorities, have been banned from the peninsula, and crackdowns even on minor events such as the Shevchenko gathering appear designed to stamp out the first shoots of dissent. The “self-defence forces”, groups of locals who formed to counter the supposed threat from Ukrainian radicals and who accompanied the “little green men” when they went to flush Ukrainian soldiers out of their bases, have now been given uniforms and legalised as the “people’s resistance force”. Of the roughly 10,000 who signed up a year ago, 500 are now involved full-time in the structure. On the wall of their headquarters in central Simferopol there is a laminated Putin portrait and a framed headshot of Joseph Stalin. “The best thing is that there is no stress when I turn on the television,” said Vladimir, a 50-year-old deputy commander of the “people’s resistance”. He carries a pistol with a personalised engraving from the Russian defence minister, Sergei Shoigu, marking his courage in the events that led to Crimea “rejoining” Russia. Vladimir said the resistance forces would remain in operation “as long as the people need us”. A spokesman for the forces said they took part in “tasks the police and the army cannot do” such as “renationalising” Ukrainian state property and transferring it to Russia. On Friday, Simferopol’s central Lenin Square was being spruced up with Russian flags in preparation for the anniversary festivities. Thousands of children will gather on the square to make a huge Russian flag, there will be military parades, and people hope Putin will visit. Most of those here who believe Crimea should be Ukrainian remain quiet – to say so is to risk a charge of “separatism”, punishable by up to five years in prison. Even reading Ukrainian poems can be dangerous, as Kuzmin found out. Two days after the Shevchenko gathering he organised, he was fired from his job as a history teacher. He had not even waved a Ukrainian flag at the gathering, but was accused of “standing near” the flag and of not stopping others from unfurling flags, including one which said “Crimea is Ukraine”. The head teacher said he had received a phone call from the authorities and been ordered to fire him. “Some of my colleagues quietly expressed their solidarity and said they were sorry for what had happened to me, though nobody made any kind of public stand,” said Kuzmin.